ArimaaÂ® is a game where stronger animals like elephants and camels try to push and pull the weaker ones from the opposing team into traps while one of the rabbits tries to sneak across the board and harmlessly reach the other side. The first player to get a rabbit to the other side wins. This may sound like a simple kids game; and while it is easy enough for your kids to learn and enjoy, you will find that it is also a very deep game that can take a lifetime to master. 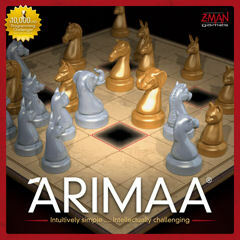 ArimaaÂ® is one of the deepest strategy games ever invented in the history of mankind, but designed to look intuitively simple. In just the first ten moves of ArimaaÂ® there are more possible games than there are atoms in our universe. No two games of Arimaa are ever the same. There is much to learn and discover about this intuitively simple, yet intellectually challenging game. This game also doubles as an animal-themed chess set! Arimaa is a gem of an abstract strategy game. Two players each control a Chess-sized and distributed collection of pieces, each represented by an animal from rabbit to elephant size. They are placed in any distribution in the two hindmost rows of a standard 8x8 board, but four "pits" are evenly distributed across same board into which pieces can disappear. Every pieces has the same movement, but larger pieces can push and pull smaller ones around the board. The goal is to get one one's rabbits (think pawns) to the opposite wall. This might be a confusing abstract of the game's rules, but to consider that a profoundly deep game emerges from such a simple concept is simply grand. Another new classic along the lines of Abalone or Khet, highly recommended!